Cylindrical; loop handle. Painted with a man and woman with a running hare in a landscape, inscribed below: Laufs wild bräth immer hin nach dem frag ich nicht vill: ich hab schon was mich freüd: und was ich haben will. Pewter foot, and inscribed lid. Laufs wild bräth immer hin nach dem frag ich nicht vill: ich hab schon was mich freüd: und was ich haben will. 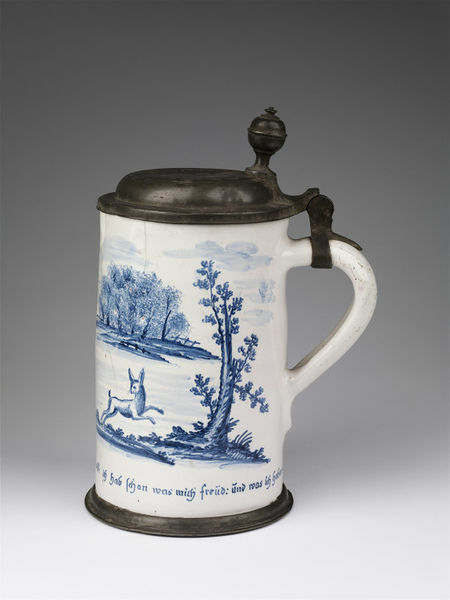 Originally thought to date to about 1775. Bought from Cecil N. Spero, London. 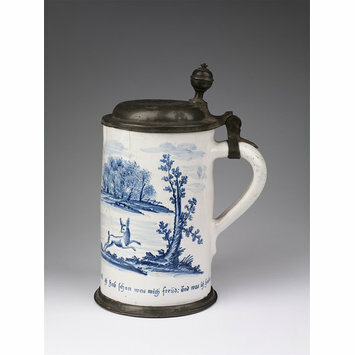 Tankard of earthenware covered with a tin glaze, painted in blue and mounted in pewter. German, Friedberg, about 1754 to 1768. The pewter lid dated 1778. Inscription: I don't ask for the running hare, anyway I already have what makes me happy and what I want to have!